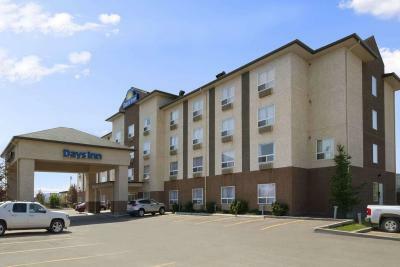 Lock in a great price for Days Inn by Wyndham Edmonton South – rated 8.4 by recent guests! I’ve stayed previously and liked it but the hotel is deteriorating fast from either poor maintenance and or management. I won’t stay here again. The breakfast was great with lots of choices and the staff that worked in the breakfast area were helpful and friendly. The room was quiet which is an added bonus for me! Reception was knowledgable and helpful. Clean, comfortable bed, good breakfast, we had a great sleep. Clean and comfortable. Great value. Excellent breakfast. Great value for your money. All the staff are very friendly. Room and common areas were very clean. Nice breakfast with a lot of choices. Staffs were very pleasant and helpful. Breakfast and parking are inclusive of what you are paying. Unlike most hotels downtown that would charge you an arm and a leg. Just a few minutes away from downtown. Easy to find, friendly staff and lots of restaurants in the area. Easy check in and check out. Would stay here again! Days Inn by Wyndham Edmonton South This rating is a reflection of how the property compares to the industry standard when it comes to price, facilities and services available. It's based on a self-evaluation by the property. Use this rating to help choose your stay! This hotel is within a 10-minute drive of downtown Edmonton and the University of Alberta. It offers free Wi-Fi in public areas and free on-site parking. Days Inn Edmonton South features a microwave and small refrigerator in every guest room. They also include ironing facilities and a coffee maker. A deluxe continental breakfast is served every morning at the Edmonton Days Inn. A gym and business center are available. Edmonton International Airport is 25 minutes from the Days Inn. This property is also rated for the best value in Edmonton! Guests are getting more for their money when compared to other properties in this city. When would you like to stay at Days Inn by Wyndham Edmonton South? Rates are based on double occupancy, each additional person will be charged CAD 10 per night. This double room features air conditioning, flat-screen TV and tea/coffee maker. This suite has a microwave, seating area and air conditioning. This suite features a seating area, microwave and tea/coffee maker. This double room has a tea/coffee maker, air conditioning and toaster. This quadruple room features a tea/coffee maker, air conditioning and cable TV. This double room has a toaster, tea/coffee maker and air conditioning. Some of the amenities you will find at Days Inn Edmonton South include our Daybreak Café breakfast, featuring a hot breakfast sandwiches, as well as muffins and bagels freshly delivered daily from our neighbourhood Tim Hortons. All of our guests have access to our fitness room and a business centre with complimentary high-speed Internet and printing services. House Rules Days Inn by Wyndham Edmonton South takes special requests – add in the next step! Free! Up to three children under 18 years stay free of charge when using existing beds. One older child or adult is charged CAD 10 per night when using existing beds. Days Inn by Wyndham Edmonton South accepts these cards and reserves the right to temporarily hold an amount prior to arrival. The smell of our first room was awful it smelt as if something died in our room. When we arrived our door was left wide open and our window was open to try and air out the room but I did not help at all. As well there was hair left in the bed. Pillows were great. Rooms were spotless! The room was too warm even though I turned the thermostat down to 63 degrees, it felt like it was 75 in the room making it quite unpleasant for me. Nice quiet room (I was worried when I saw how close to the elevator it was), very clean and comfortable. Nice breakfast included. Friendly and attentive staff. Close proximity to UofA Hospital. Really nothing it was perfect. Breakfast was great and the location. We were is for a family wedding so the location worked very well. Easy to find and we would stay again. Location, breakfast and staff were great as usual. Staff were extremely friendly and helpful. I really enjoy the breakfast and very good coffee .We had a little surprise from the front desk very nice gesture. the staff always have smile and trying to help as munch as possible. Thank you to them. Single staff member working in breakfast area was being over run and food items were not readily replenished but there was a good variety of food items. Great quiet room with excellent mattress and friendly helpful staff. Room was a bit warm and we couldn’t figure out how to turn it down (but we didn’t bother to ask). I originally booked incorrect dates online, and when I called, dates were corrected no questions asked. Great price, very clean and complimentary breakfast. It fit our needs perfectly!